Take that road less travelled: Potash Road, Utah | Oh, the Places We See . . .
Just put a road we don’t know in front of us, and we’re likely to drive it — side roads, byways, you name it. But one thing we learned while driving in Utah is this: If it says Utah Scenic Byway, don’t miss it. To get there from Moab, drive about four miles along Hwy. 191 to Utah 279 — Potash Road. It’s one long stretch — about 30 or so miles round trip — but any part of it will have you falling in love. On your left going in will be breathtaking views of the Colorado River. On your right — steep red rocks, petroglyphs, and mesmerizing scenery. First, look for rock climbers about four miles in. The climbers we saw must have been taking a class, since instructors were at the ready, coaching them as they scaled red, jagged rocks along Potash Road. Locals call it Wall Street . . . with good reason. Second, drive about thirteen miles down for a view of Jug Handle Arch. And if you get out to take pictures, look for cliffs below Dead Horse Point State Park in the distance. View of Jug Handle Arch as seen from Potash Road, Utah 279. Third, drive all the way down to the Moab Salt Plant where a mineral used as fertilizer — potash — is extracted and processed. On the day we were there — a Sunday — trains stood still. But we could imagine the huge operation of loading boxcars for distribution throughout the U.S.
No trains filled with potash running on Sunday. Just lined up and waiting. On your drive back from the potash plant, look left or right, and you’ll be amazed at the scenery. Still waters of the Colorado River reflect rock formations bordered by shrubs that turn golden yellow in the fall — a postcard picture suitable for framing. Postcard perfect: Scenic view of Colorado River along Potash Road. Hikers know the area. As do campers, RV travelers, and just plain ol’ sightseers like us. Lone hiker makes his way along Potash Road. Finally, don’t miss the petroglyphs . . . as we almost did. Even with a sign that says “Indian Writing,” we couldn’t locate the drawings. Cars pulled over. 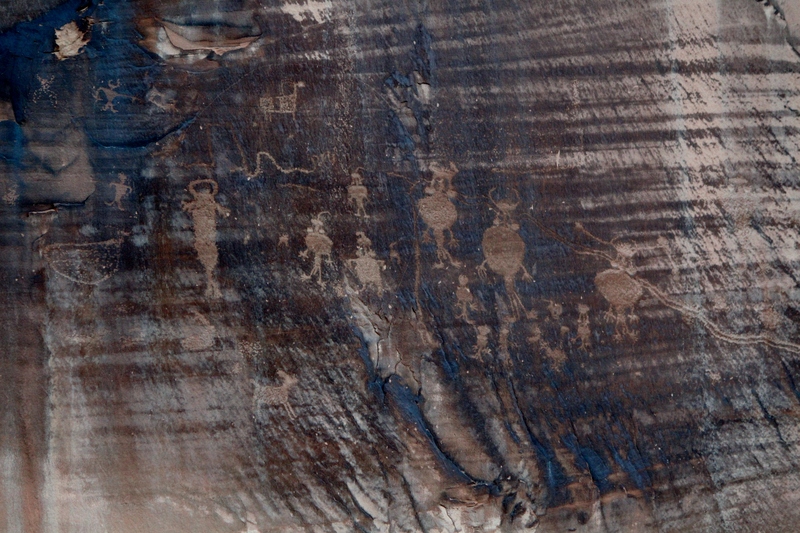 People staring at the petroglyphs. But when someone familiar with the area pointed out the artwork to Bert, we immediately picked up on what to look for and where. Sometimes you need someone to point out the location of petroglyphs high up on the cliffs. Some drawings resemble people with triangular-shaped bodies. And several seem to be carrying orbs or round structures of some kind. People with triangular-shaped bodies, found deep in the crevice along Potash Road. Others were harder to see because they were positioned higher or tucked into a tiny, dark crevice. But keep looking. You won’t be alone. Many visitors stand for a while looking, pointing, and sharing what they see with others. Look carefully to see petroglyphs tucked inside a crevice along Potash Road. So, when’s the best time to drive Potash Road? We recommend an afternoon excursion timed for late-day shadows on red sandstone cliffs. But we imagine early morning has its benefits, too. This is a photographer’s paradise, so pack your gear and get ready. Be prepared to pull over often. Late-day viewing rewards you with rich colors and vivid contrasts. No matter what time of year or what time of day you go, make Potash Scenic Byway a destination rather than a mere happen-upon place. It really is that good. For other posts on the natural beauty of Utah, check out We Saw Utah in our Travel Series. And access all our photos of Potash Road on Flickr. This entry was posted in Photography, Travel, Utah, We Saw Utah! 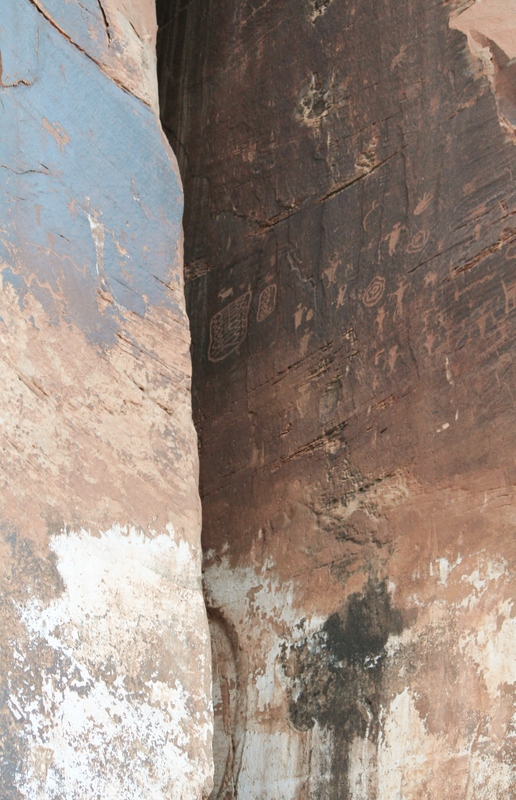 and tagged Jug Handle Arch, petroglyphs, Potash Road, Potash Scenic Byway, red rocks, Utah. Bookmark the permalink. Wow, these are some gorgeous photos. My husband and I hope to do a tour of the US national parks next year. Thanks for showing us some of the great places to include. You definitely can’t go wrong in Utah. We didn’t include Zion, but it’s truly a treat, especially if you hike. We just didn’t take pictures when we visited several years ago, and when it came to cutting back on vacation days this time, we decided not to return. But, oh, how we want to. Best wishes on seeing the parks! Now that’s what I call scenery! 🙂 🙂 Awesome! Thanks so much for taking a look. These are breathtaking formations, and, paired with the river reflections, they’ve become some of my favorite photos, too. Lovely. Just lovely. I wanna go back!!! Most definitely postcards and photographers delight! I just don’t get the urge to rock climb, though. Enjoyed traveling along with you today. Rock climbing is not for us either. However, if you’re gonna do it, do it where there’s gorgeous scenery! Thanks for taking a look. We enjoyed stumbling on this pretty place. Love your blog and the posts about parks in Utah. You definitely had the right vehicle to traverse the red clay roads. We didn’t, so we stuck to the paved paths. But no matter what, the rocks and scenery took our breath away! What a great state for natural beauty! I’d love to see Shafer trail, too. And there’s one more thing that we didn’t know about until we got home and searched the internet: dinosaur tracks! Of course, we almost missed the petroglyphs, so we’re not surprised we drove right past the dinosaur tracks sign. We both need to go back! It’s a beautiful drive. I want to go. I love love love Utah, so much to see! Thank you for sharing this; hopefully someday I will be there too! We hope you do get there, Dawn. It’s some of the finest scenery anywhere. We loved our drive right around 5:00, I guess, so that’s what we would recommend for anyone in the area. Best wishes for a good weekend! Thanks so much for taking a look! We were truly wowed by this place we never even expected to see, and, as you can see from the photos, one of the prettiest places in Utah. Here’s hoping more people will read about Potash Road and drive it to the end! Best wishes for a great weekend ahead.